Cute. 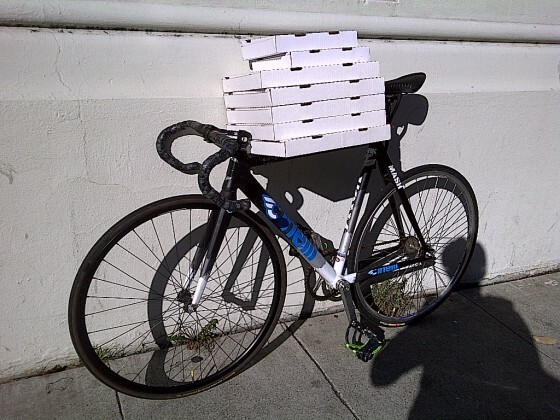 Empty pizza boxes balanced on somebody’s bike. If there were any real delivery involved, those boxes would be inside a thermal bag and strapped down. OHMYGODYOUGUYSGOTTHEJOKE! Gold stars all around! Hey, that’s the bike from the stolen video 3 days ago! Beer-can Cinelli…probably for the best. right here regularly. I am moderately sure I’ll be informed many new stuff proper here! of the challenges. It was truly informative. Your website is useful.